civilians as possible prior to the elections this April. The SPLA met resistance in Akot from the cattle wranglers. Fighting broke out, the army base was attacked, and the town was then burnt to the ground by the SPLA in retaliation. The civilians fled to the bush having lost everything. The SPLA has increased its presence in the area significantly, but no active fighting has gone on recently. People have begun seeking care again at the small, newly opened, mission hospital on the outskirts of town where we plan to operate. The missionaries on the ground there feel it is safe for us to now come. Most people have never received any eye care in their lifetimes, and many suffer from needless blindness. Please pray that we will be able to help bring the gift of sight as well as Christ's healing and peace to this broken, hurting town. We have had over 150 of the Tenwek staff commit to praying with us daily for the people of Akot over the past month. We hope to preform at least 100 sight restoring surgeries during our week visit. This will only be possible if the Lord works in a mighty way. The obstacles to locating and mobilizing the blind to a point of care in a war torn country are innumerable. Two Kenyan community health workers from Tenwek have been working in the Akot region for months to do just this. Pray that God will bless their efforts. Please also pray for the patients' safety as they begin traveling even now. Pray for the eye team's safety as we (eight of us) travel by van to Nairobi today, fly commercially to northern Kenya tomorrow, and then board a small mission aircraft to take us to the airstrip next to the mission hospital. We plan to arrive back in Nairobi on March 5th. Below are pictures of Akot post the January burning (our community health workers are surveying the damage). Please be praying with us. 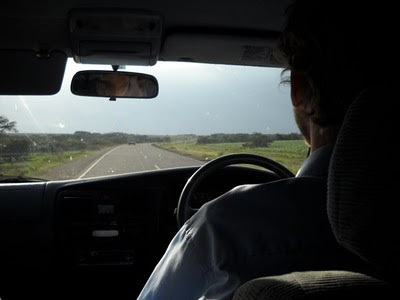 Unlike Jason, the rest of us grew up driving only on the right side of the road, and therefore adjusting to Kenyan driving takes some intentionality. Today, I drove into Nairobi for a national family medicine meeting. It was a good meeting, and I met some impressive folks. The six or seven hours of driving gave me a chance to see 3 giraffes and a baboon alongside the tarmac, and also some time to consider the nuances of driving on the left, and the mistakes often made when switching sides. 1. Getting into the car on the passenger side when you're the driver (novice mistake #1). 2. Taking your right hand turns tight and/or without looking both ways for traffic. 3. Taking your left hand turns wide and/or spending too much time watching for opposite traffic. 4. Turning on the windshield wipers instead of your turn signal (since they are on opposite sides). 5. Neglecting your rearview mirror, since you're not used to looking for it on your left. 6. Hugging the shoulder, which may not really be all that bad an idea. 7. Not knowing how fast you can go, because there are no speed limits, but you can still get pulled over (by a cop standing on the side of the road, because they have no vehicles) for speeding, though they have no radar gun or other monitoring device. 8. 3+ lane roundabouts. Enough said. 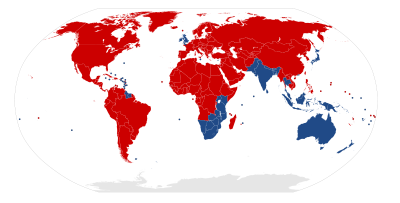 Here's a map of where in the world they drive on the right (red) or left (blue). Interestingly, although most of the world used to drive on the left (including the US), only 34% of the world currently does. In our busy-ness and recent internet woes, we have neglected to give props to a very important visitor who just spent a month with us: our good friend Carlan Wendler. Carlan is from southern CA and is doing his ER residency at LA County Hospital (sounds like a crazy place). He has known various members of the McCropders for some time now...mostly due to the fact that he did med school at the University of Michigan, 2 years behind Eric and 3 years behind John. He also attended Knox. We are really excited, because Carlan is considering joining up with us when he finishes his residency in the summer of 2012. At that point, we might need a name change to the McCropdLers. Catchy, huh? :) No worries, we won't change the blog address. So Carlan joined us here at Tenwek for almost 4 wks, and sadly left yesterday to return to the States. He expressed the sentiment that many of us felt--hard to leave, but working in such an environment reminds you of the need for MORE TRAINING, so he's gone back to get some more learnin'. That and I think he's under contract. 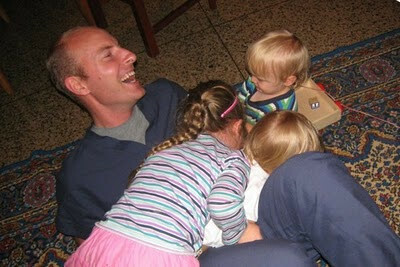 He was a welcome breath of fresh air, bringing candy and racquetball equipment upon arrival, playing with the kids, taking lots of great pictures on his fancy camera, sharing meals, and most importantly asking stimulating questions about our future and our lives here at Tenwek. And he was a good sport when all the guys left to go to Brackenhurst, sharing meals with 4 women and 5 kids (only one of whom was male). The above picture also features our friends Chris and Suzanne Gayton, ortho and ER, whom who also know from Knox, and arrived for 2 weeks just before Carlan. It's like a mini-Knox in Kenya! Further evidence of Carlan's good sport-edness...on our way to Masai Mara, the car we were travelling in got stuck. No worries. 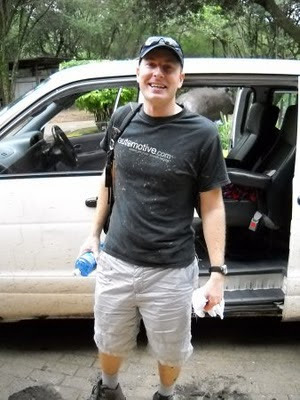 Carlan jumped out to push, and arrived at our 5 star resort covered in mud! First, the result and then a couple thoughts. My second weekend on call was still quite tough, and though better than before, 3 kids died in my 48-hour shift. My ability to walk through this tragedy was to me the evidence that God is indeed teaching me something, even as I am confounded at the beauty and the brokenness all around me. I didn't have to pull anyone in from home for reinforcements this time, slept a decent amount both nights, and even finished daily rounds at a decent time on Sunday (Saturday didn't really fit my idea of "decent"). Thoughts: First, know that all the feedback from all of you was so much appreciated. Knowing that so many people care, sympathize with my difficulties, and are even personally challenged by it - it all makes a huge difference and was very encouraging. Second, regarding God's mysterious goodness and how it is often veiled to us, Chuck Jacob has talked about "Extraordinary Grace in Ordinary Life". Abraham, father of faith. Did anyone have God working so much in his life? He dies in an alien land with one son, and only enough property to bury his family. Was God working? Yes. Could Abraham see it? No. Was it because he wasn't looking? No. I look forward to the day that we can praise our Maker for his love seen in all his mysteries revealed. -On Prayer: "What about when the boy is not healed? When, listened to or not listened to, the prayer goes unanswered? Who knows? Just keep praying, Jesus says. Remember the sleepy friend, the crooked judge. Even if the boy dies, keep on beating a path to God's door, because the one thing you can be sure of is that down the path you beat with even your most half-cocked and halting prayer the God you call upon will finally come, and even if he does not bring you the answer you want, he will bring you himself. And maybe at the secret heart of all our prayers that is what we are really praying for." -"Who knows whether their acquaintance with grief will open their hearts also to the grieving of others or whether it will turn their hearts to stone? But for the sake of the one who bore it before they did, we are to honor them for the sanctity of their burden. For his sake, we are called to see their terrible beauty." I did write a song, because as Carlan says, I "process life through music". My fear is that the song won't stand up to the subject matter, but since I busied the limited Kenyan bandwidth to upload it, I may as well share it. Today Jason, John, and Eric are en route to a medical conference near Nairobi. They are looking forward to good CME and good conversations with other doctors working in different parts of Africa. While the McCropder men are away for a few days, the women and children continue daily activities here. And just what might these activities include? For our next installment of the Case of the Week, I would like to introduce you to Baby K. Before you yell "HIPPA!" for my use of his initial, know that all Kipsigis males have a name that starts with "Kip-", but we'll talk about that another time. Baby K is special to me for several reasons. 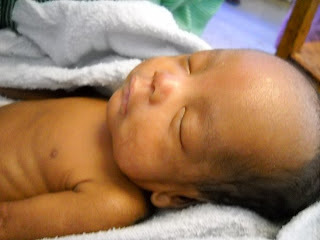 He was admitted to the NICU over 2 months ago, when he was born premature at 26 weeks, which may even be touch and go in the US, but is very difficult to survive here (I've seen one other survivor from that age in my 2 months here). He is a miracle in several senses, most notably that his weight bottomed out at 680g (just a bit over a pound), which is the lowest I've seen here. And fast forward over 2 months, through blood transfusions, sepsis, respiratory distress syndrome, a PDA despite NSAID therapy twice, and weeks of oxygen therapy, and he was ready to discharge today at just over 1900g. So this little guy (whom mom graciously allowed me to photograph this morning) may still be showing his ribs through his skin, but he's a chunky picture of health to me. He's also the last child in the NICU that had been there longer than me. Tenwek invests a lot of resources into saving lives of tiny babies. This is tough, because many days the baby doesn't make it (today was one of those days as well), and one can be left wondering whether we're appropriately using our limited resources. One thing is undeniable though. The hospital is sending a message that life is valuable, and with so much death around, that's a message that is often in need of hearing. And then there is Baby K, home now with mom and dad, by God's grace, with a life before him. 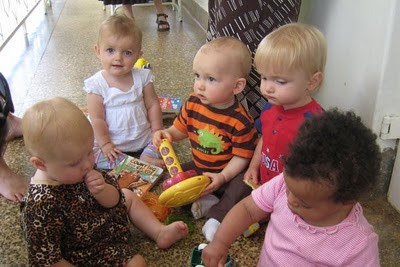 We've started a Monday morning playgroup with some of the missionary kids around here--one of the amazing things is that there are five kids within a five month age range of each other (9 months, Maggie, to 14 months, Abi). 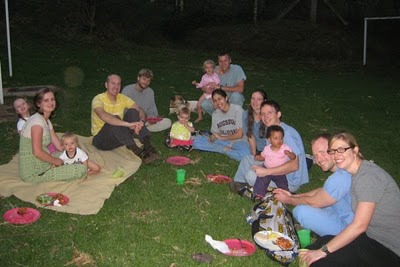 Included in this photo is Clara Hedges, whose parents are spending a year here doing OB and surgery, and Liam Banks, whose dad is an FP international health fellow, here for five months. Looking at this photo, you can: a) pick Abi Fader's head out of a crowd, and b) see who the camera ham is. Looking sharp, Mags!